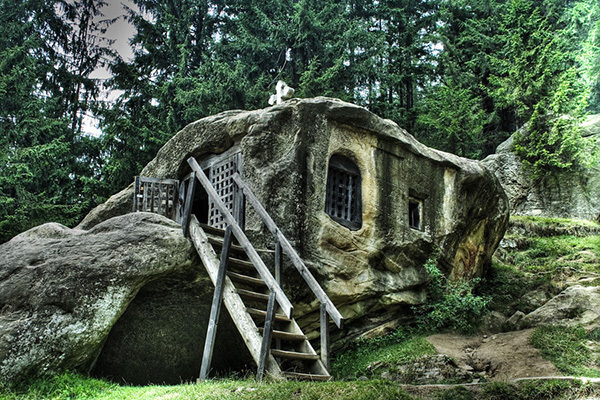 This boulder house combines numerous really good ideas – earthbags, lower cost lightweight insulating material such as rice hulls, option of mixing the hulls with a stabilizer such as lime or cement for greater moisture protection, a bamboo or sapling frame to support the bags, and durable plaster to give the structure long lasting protection. There are so many great advantages to this boulder house that it is rather difficult to convey everything in one blog post. Of all the excellent natural building methods, this is certainly one of the top choices. In fact, the next opportunity to build another prototype building (no more land currently) this is how I would build, because it’s perfect dirt cheap housing for do-it-yourselfers. The boulder house, which I now refer to jokingly as the Checkout Ranch, is a tiny house/survival shelter/bugout shelter. The main goal is to create a safe, durable shelter as quickly, easily and cheaply as possible. Think “dirt cheap”. A small shelter the size shown in the photo above could be built for under $1,000. This is possible because most all of the materials are very low cost. It uses small diameter bamboo or saplings that grow free in nature to create an organic shaped framework that is covered with rice hull concrete earthbags and plaster. The final product would be something comparable to ‘rice krispie concrete’ (insulating air spaces held together with a binder). See previous story on rice hull concrete. The size and layout has many options. It could mimic the size and shape of an efficiency apartment, a typical tiny house, cabin, simple shelter or other design. Choose a practical, efficient layout and enclose the space with the frame, bags of rice hulls and cement plaster to create a natural boulder appearance. Bags of rice hulls mixed with cement and plastered in cement would create a durable, weather resistant shell that looks completely natural and blends in perfectly with nature. The exterior could be shaped and textured to mimic boulders in the area, plus coated with oxide stains to simulate weathered stone. All or part of the boulder home could be covered in living walls of food producing vines such as raspberries or blackberries, and surrounded with other plants for concealment. The floor plan may be the same, but create vaulted/organic shaped interior to make more efficient use of materials and avoid a boxy living space. The finished interior would look much like a natural cave, except it would have the size, shape and features of a modern apartment or tiny house. One idea is to fill 12” wide mesh earthbag tubes with rice hull and cement mix and stack and tie them against the bamboo frame. Arkitrek calls rice hulls mixed with lime ‘bio-crete’, and points out how various types of agro wastes can be used. While you could make bricks, blocks, etc. with this ‘rice hull-crete’, it seems easiest to use earthbags because the bags are cheap and it’s easy to create organic shapes. You could also use lightweight, insulating aircrete in narrow earthbags (preferably mesh bags for stronger bonding with plaster). Whatever your choice, plaster over everything by hand or with a mortarsprayer after the rice hull-crete/rice hull cement dries. – It’s best to use lime or magnesium oxide (MgO) based cement because they are greener options than Portland cement, however they can be harder to find and more expensive. Magnesium cement is a type of geopolymer cement that is very durable. – Recycled waste materials such as rich hull ash, fly ash, expanded clay or expanded glass can be used in the mix, thereby making the material carbon neutral. – earthbag tubes are easy to fill and create organic shapes – just stack against the bamboo frame. Attach with poly twine as needed. – recycled bags may be available and less expensive than tubes. Mesh material will provide superior bonding with the finish coat. – assuming R- 2.5/inch, 12” tubes would create a 10” thick wall with approximate R- 25 walls. This insulation is helpful in hot and cold climates. – Notice the nearly vertical walls in the photo. This makes it easy to incorporate cabinets, shelving and furniture, and add small eyebrows to deflect rain and collection of roofwater. – The interior could be any shape you want, including nearly vertical walls with vaulted ceilings. I like a vaulted ceiling here because it would look good and add strength. – Over all, I like this boulder house better than my Stone Dome proposal that had a rigid geometry and layout, and relied on hard-to-find geopolymer cement. Thanks again to Askjell for a great photo.